Back in January my mother decided to take the brave step and get braces. As a kid, she never had the opportunity, and as a 36-year-old it was a huge life decision to make, but she did it. I was so proud and happy that she took the chance to finally feel comfortable with not only her smile but to feel more confident in herself as a whole. The first few weeks were rough for her. She was in so much pain that she could hardly eat and her food selection became extremely limited. Soda had to be cut out due to the possibility of staining her teeth, candy and sweets became a special-occasion-only food due to a higher cavity risk factor and overall many of the unhealthy foods she was indulging in were cut to a minimum. Within less than a month of having braces, my mom had lost 10 pounds. That alone was a huge accomplishment. She had been overweight for a majority of my lifetime and I was ecstatic to see her feeling good about herself. Around this same time, my step dad was diagnosed with a fatty liver due to bad eating habits and over consumption of Mountain Dew and other sodas. This was the final straw for my mom, her breaking point, her Aha moment. She was disgusted, upset and baffled by what our poor eating habits were producing in our family. This is when she decided it was time to change her lifestyle before it was too late. She began Weight Watchers with a co-worker and also began exercising which was something she had never really done in her whole life. It was truly a new beginning for her for many reasons. Braces as a 36-year-old, finding out her husband could potentially develop liver failure at the age of 36 due to bad health, beginning a diet and exercising. The whole situation was a learning experience for her. As time progressed, my mom kept up with her dieting and with Weight Watchers, and the pounds melted away. By the time summer rolled around my mom had lost over 30 pounds, and it was really showing, not only in her looks, but in her attitude and in her straightening smile. She was walking taller, feeling healthier, and was developing a brave I-am-going-to-try-new-things-every-second-I-get outlook on life. I had never noticed this attitude in my mom. She would never wear shorts, skirts or dresses that showed her legs, she hated being in a swimsuit, but this past summer, it was different. She was buying shorts, she was buying tankini swimsuits and she was ready to take on the world as a whole new woman. From the time I arrived home in May from my freshman year of college until the beginning of June, my mom raved about a new thing she had been dying to try. Paddle boarding. Six months prior, she never would have even thought about actually trying it. Sure she would have thought it looked cool, but I know for a fact she would have told herself “I can’t do that” or “people would just think I look stupid if I did that.” But things were different, she was determined to do it. In the meantime, paddle boarding was exploding in Traverse City. Not a day passed where I didn’t see multiple boarders out on the bay. By June 2012 the summer paddle boarding issue of Traverse Magazine hit Northern Michigan by storm and my mom found a copy of it at her work. I can honestly say, it was destiny and absolutely perfect timing. She brought it home ecstatic, willing to learn as much as she could about the sport. She raved about how fun it seemed and was in awe of the “rock hard abs all those beach babes had.” The magazine was the sprinkles to her chocolate ice cream, the cherry on top. With all the information from the articles, she was ready and determined. She was on a paddle boarding mission. She soon discovered that a co-worker’s wife who lives on Silver Lake had a paddle board so she made her way there to give it a shot. When we arrived she was first to jump on the board and give it a try. She fell within just a few seconds and I was so worried she would give up, but that wasn’t her anymore. My mom didn’t give up and get frustrated after one try anymore. In fact, she did the opposite of what I thought she would do. She got right back up on the board, stood up and laughed hysterically. Her next tries were still wobbly and completely unstable, but she was determined to get better. She didn’t give up. That night on the way home the first thing she said about her experience was “I love it, I can’t wait to try it again.” I was shocked once again by her reaction, I couldn’t believe how open-minded and positive she had become. Within a week, we were at Clinch Park Beach renting two paddle boards from The River rental shop. She jumped on with poise and confidence and a goal to stay stable, and she did. By July, my mom purchased her very own paddle board. She calls it her “sneaky exercise” because she gets a great workout, but has a fun and Zenlike experience at the same time. During the summer she spent countless numbers of hours on the water, practicing, getting stronger and making goals for herself. She went out on numerous lakes in Northern Michigan and adventured around on her board. 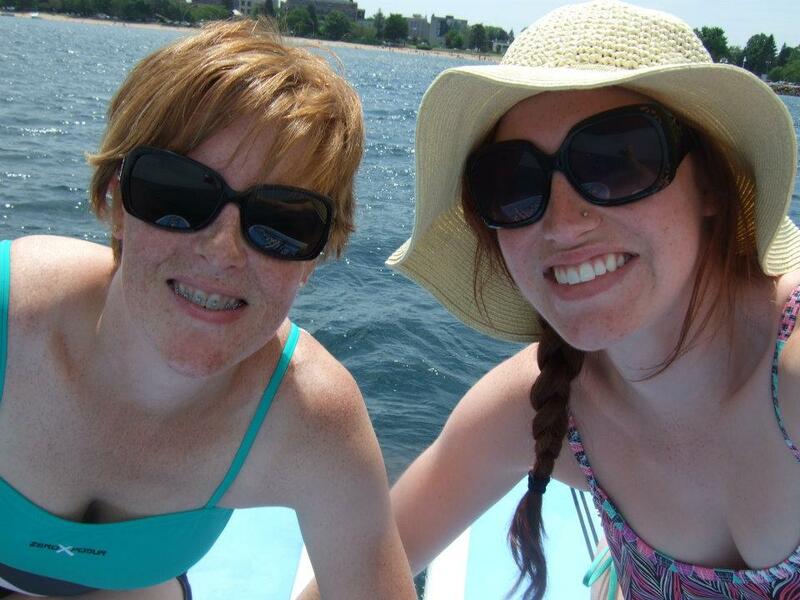 Next summer she plans to join the women’s SUP board club that goes out on Wednesday evenings. My mother has now lost over 55 pounds and she is honestly a new woman, not only on the outside, but on the inside too. She isn’t a new woman because she’s 50 pounds lighter and can fit into the same clothes as her daughter (which is an added benefit, don’t get me wrong, our clothing selection has doubled now that we can share). She is a new woman because she feels good about herself, she tries new things without getting frustrated or discouraged easily and she is healthy. She’s a new woman because she is healthier physically and mentally. She’s a new woman because she changed her life for the better and nothing but good things came from it. But most of all, she is a new woman because she isn’t afraid anymore. 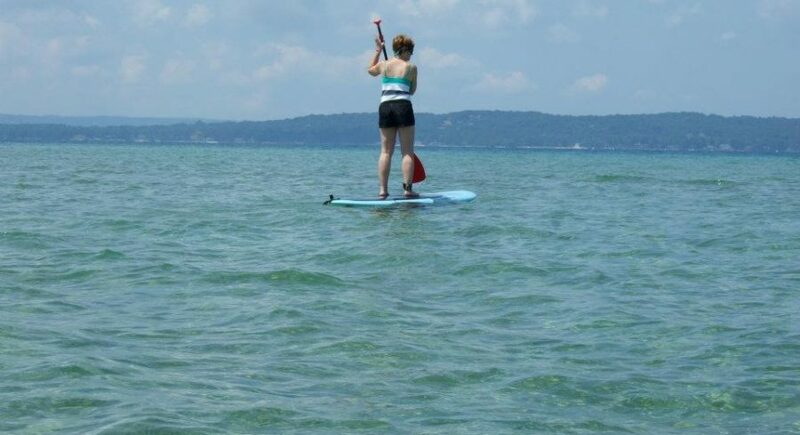 Yes, with the help of her paddle board she lost 25 pounds to total over 50. But most importantly her paddle board taught her to take chances, be confident in herself and to not get discouraged easily. Her board kept her on track with her weight loss and her positive emotions. If you haven’t been paddle boarding, I urge you to go, not because “it’s a great work out,” or because “it’s fun,” or because “you will meet cool people,” (yes all of those things are true) but I urge you to go because you will never feel more connected to Northern Michigan as you do when you are free with the Great Lake Waters. Droplets of fresh water splash your toes. It’s absolutely exhilarating. If you’ve got that Michiganders mitten-shaped heart, I can promise you, you won’t be disappointed.